The Story of a Mother is a mythical, adult tale about loss: a mental journey through the stages of grief, resistance, despair, mourning and, eventually, acceptance. Psychological realism in the guise of a fairytale. Hans Christian Andersen's text "The Story of a Mother" was first published in English in a small collection called A Christmas Greeting to my English Friends just after Christmas, 1847. Andersen was very visually oriented. He made drawings on his travels, and of course there's his beautiful papercuts. The language of his stories is brimming with imagery, and he has been called "the man who painted with his pen". Hans Christian Andersen's original tale is very short, five and a half pages. In his interpretation, Peter Madsen has taken Hans Andersen's visions further, and at times he has added new ones. The story is expanded to a format of 64 pages in water colour and gouache, making it possible to elaborate on its atmosphere and deeper psychological and mythical layers, not least its redeeming ending. Peter Madsen has worked on the story and his personal interpretation of it for close to twenty years. 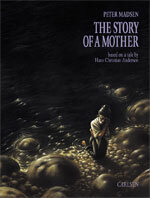 A filmed version of The Story of a Mother is available on DVD directed by Peter Madsen, with music by David Firman, recorded by The Danish Broadcasting Corporation's Radio Sinfonietta. So far, the book has been published in Danish, Norwegian and French, and in an English-language version for the Danish market only. "The way he puts the poet's symbolic words into images is very impressive indeed. The result is both moving and agonising ... possibly his best work ever." "The end result is a dashingly beautiful homage to Hans Christian Andersen." Layouts of pages 26-27, sketches of the briar.